A spacious, contemporary luxury home, set within walled garden with panoramic sea views. Amenities satellite TV/DVD, stereo system with iPod dock, WiFi broadband internet, fully air-conditioned, fully equipped kitchen, 3D TV room, games room with pool table. 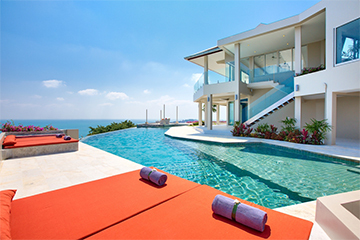 Summit Villa 3, AKA Ban Bon Khao, is a spacious modern 6 bedroom hilltop home, with 270 degree sea views over the north-eastern tip of Koh Samui. Bright and airy living areas seamlessly open onto decks via floor-to-ceiling foldaway glass doors, with glass balustrades providing unobstructed views of the stunning vista. The main living area, which occupies the entire top floor, is accessed from the primary entrance, and includes a lounge, open-plan kitchen, and dining area. A vast wraparound balcony includes a viewing deck with a bar, al-fresco dining set, and lounge furniture. The living room features a suspended LCD TV, as well as a Bose sound system. A staff kitchen off the living room offers unobtrusive catering. An open staircase leads down from the far end of the upper deck to the pool deck, with a second bar, BBQ, and lounge area. The large infinity-edge swimming pool features a 25 metre lap length, a 2.5 metre deep diving area, built in day-beds and parasols, and an adjacent sala pavilion. Opening onto the pool deck are the AV room and games room. The AV room seats 10 in comfort on built-in sofas, and is equipped with a large 3D LCD surround system with a library of movies and satellite service. The adjacent games room contains a pool table and lounge seating. Summit Villa 3 includes 6 en-suite bedrooms, all of which feature air-conditioning, ceiling-fans, private terraces, and spectacular sea views. Four of the bedrooms are doubles with King-size beds, and two of the bedrooms are twins. Most bedrooms also have sofa-beds that can accommodate additional guests. Complimentary high speed WiFi internet is available throughout the villa, which is staffed by a dedicated team of 3, including a live-in manageress, who are available to cater to your every need. Summit Villa 3 is a luxurious and comfortable home suitable for families or groups of friends, and is conveniently located within easy reach of the island’s best beaches, and a wide range of entertainment venues. There are numerous dining venues and bars within the vicinity, as well as a gym, water-sports, and spas. Located within a secure gated estate, Summit Villa 3 benefits from 24-hour security and free access to a communal tennis court. Summit Villa 3 is located within a minute’s drive of the idyllic Choeng Mon beach, with the tourist Mecca of Chaweng, and the charming Bophut Fisherman’s Village both within 10 minutes drive. Koh Samui airport is 10 minutes drive away.